The Tim Mälzer Kamagata series of kitchen knives makes an impact with its high standard of functionality, robust quality and minimalist aesthetics. With its clean-lined design, the knife collection focuses on the essentials required for efficient processes in the kitchen. At the beginning of the multi-year development process in Japan, Tim Mälzer designed the original blade shape himself. The Kamagata series comprises seven blade shapes: a hybrid kitchen knife and office, all-purpose, bread and ham knives. 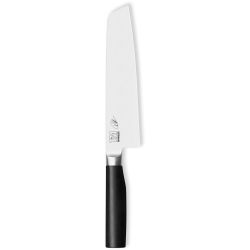 In addition, the series also offers the classic European chef's knife shape and a Santoku. The attractively shaped blades of the series are forged from corrosion-resistant steel 4116. They have a hardness of 57 (±1) HRC. Tim Mälzer's logo and personal signature are applied to the blade and, together with the satin finish, complete the exclusive and high-quality overall look. The black handle made of polished POM plastic is particularly easy to clean and lies comfortably in the hand. Tim Mälzer’s own “bull in the kitchen” trademark adorns the end of the handle, adding a sophisticated highlight. Both series are suitable for both left-handed and right-handed users. Small Office knife.Blade: 9cmHandle: 10,3 cm..
Utility knife.Blade: 15 cmHandle: 10,3 cm..
Tim Mälzer Kamagata Slicing knife.Blade: 23 cmHandle: 10,9 cm..
Tim Mälzer Kamagata Bread knife.Blade: 23 cmHandle: 10,9 cm..
Tim Mälzer Kamagata Chef's knife.Blade: 20 cmHandle: 10,9 cm..
Tim Mälzer Kamagata Hybrid kitchen knife.Blade: 20 cmHandle: 10,9 cm..